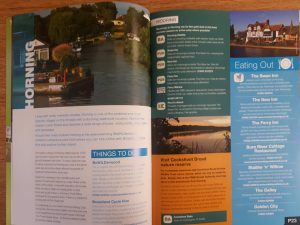 Norfolk Broads Direct has published its own A to Z souvenir guidebook to the Broads National Park. The glossy publication will be given exclusively to customers in their welcome pack to help them to make the most of their holiday and act as a lasting memento of their time with us. 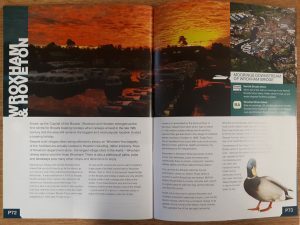 The 76 page guide to 39 riverside villages and other destinations has been written and compiled by one of our skippers, Oliver Franzen, with support and inspiration from the whole team at Norfolk Broads Direct. 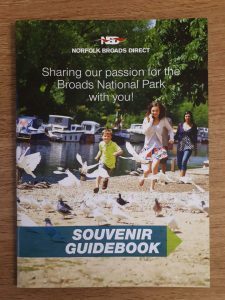 “Here at Norfolk Broads Direct we are truly passionate about the magical Broads National Park so we wanted to write our own guidebook, rather than commission one, to share our love and local knowledge of the area with customers,” explained director Barbara Greasley. Each destination has a summary paragraph and inspiring photos to help customers to easily find their favourite places to visit. Once they arrive at their chosen destination they can read a full article to make the most of their visit. There is also bite sized chunks on mooring and eating out plus a useful key detailing mooring types and dog friendly eateries.